Last year Hayley from Danglefoot Polish began making duos based on characters from the TV show Once Upon A Time and tonight I have some of the newest additions to share with you. 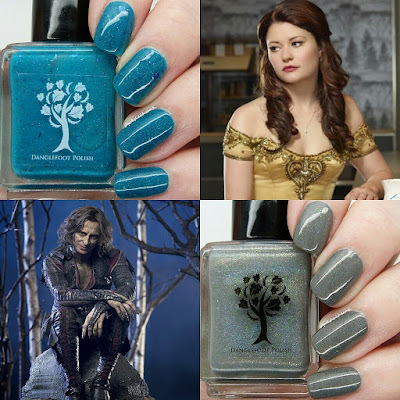 Belle and Hello Dearies is obviously named after the characters Belle and Rumpelstiltskin and made in collaboration with the lovely Becca from A Certain Becca Nails. The duo was originally released before Christmas but I didn't get them as I was rather poor and wasn't sure how I felt about Belle. It's safe to say I've now changed my mind.. Read on to see why! 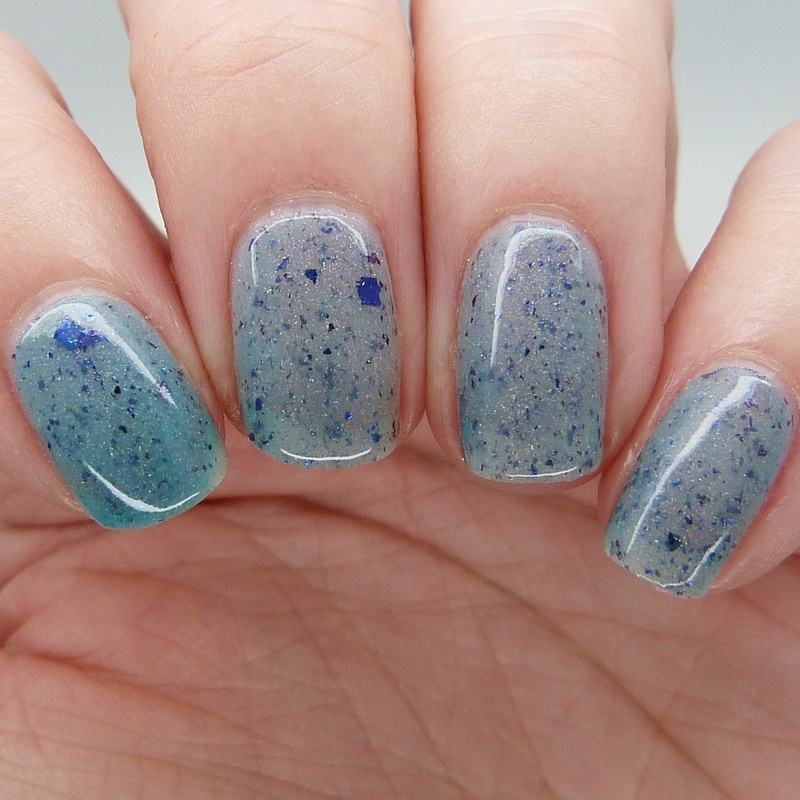 Belle is a gorgeous thermal which is a deep turquoise in it's cold state and becomes a pale icy blue when it gets warm. 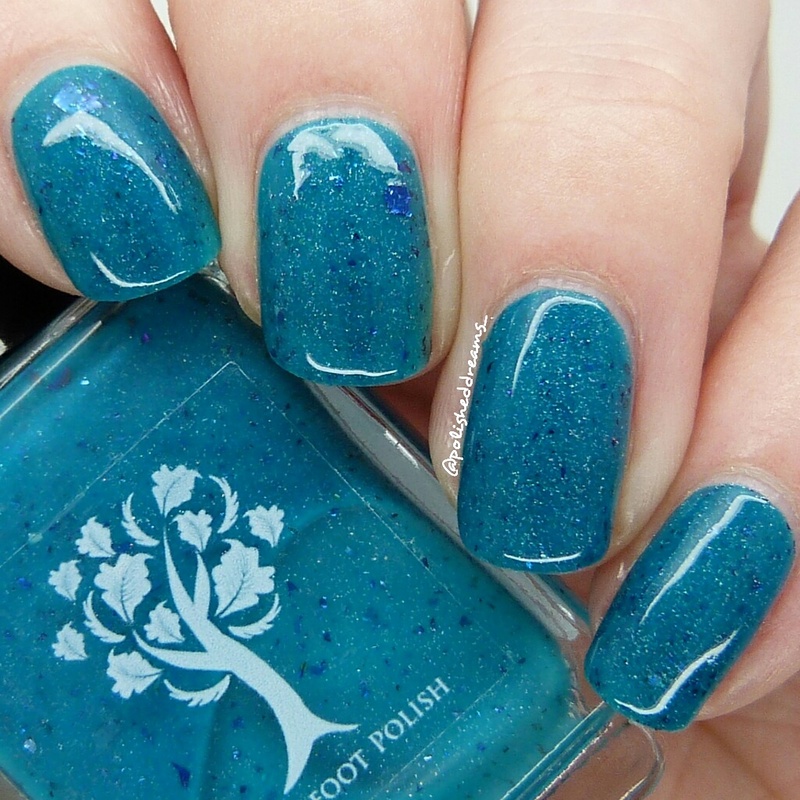 As if the colour changing wasn't enough, it also contains holo sparkles and chrome blue/green flakies. This polishh was the epitome of Hayley's creations - stunning and with the most amazing formula. It was so smooth and not too thick on thin making it easy to apply. Hardly any clean up was needed which always makes me happy! Shown here is two coats. Here is Belle shown in its warm state (after I heated it quickly with the hairdryer!). Hello Dearies is a beautiful grey linear holo with gold shimmer and green chrome flakies; a perfect combination of Mr Gold and The Dark One! Again this had a great formula, slightly thinner than Belle but still easy to use. Shown is two coats and topcoat. Hayley has created another gorgeous duo and I'd definitely advise getting them if you can! Belle especially is such a unique polish, how can anyone resist? I'm just shocked I wasn't keen on it before! Admittedly maybe I was just trying to rationalise because I had so little money haha! I have another OUAT duo to show you soon so look out for that post coming in the next few days. You can buy this duo from Hayley's shop here. She's also just released another duo and special individual polish which I am soo excited to receive! Find them here. Such a gorgeous duo and you've swatched them so well. I love Belle, is stunning.